made from a variety of materials. to carry their merchandize and who introduced this particular bead type for trading. for use in rosary-making by even the youngest of children. before attempting to teach others. Gather your materials on a clean, dry work surface. 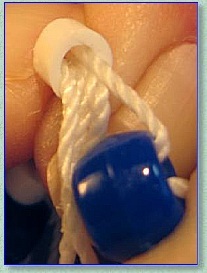 any cord which fits easily through the bead opening may be used. and another for the Our Father beads. Young children love to use multi-color beads, and they tend to arrange them in no specific pattern. of the Our Father beads. to form designs and then melted together with a clothes iron. Perler Beads are available in many colors and degrees of opacity, including varieties that glow in the dark. 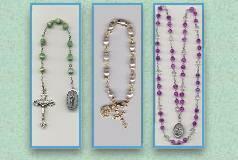 They are the perfect size for spacers on a Pony Bead Rosary, but any tube spacer may be used, or none at all. 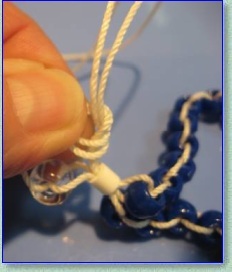 1) Fold the cord in half and insert the loop formed through the opening in the Crucifix. Draw the ends of the cord through that loop, and pull tightly. 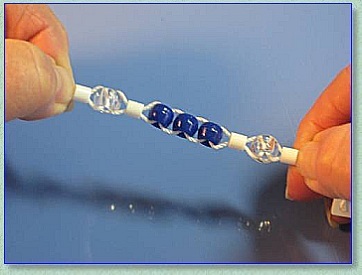 2) Insert both ends of the cord in a Perler Bead and draw through. 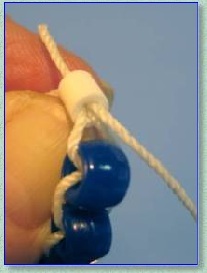 3)The beads are connected by inserting the left side cord through a Pony Bead and drawing through to the right. The right side cord in then drawn through to the left. Add the first Our Father bead and pull the cords all the way through. 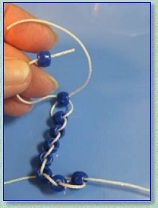 4) Add another Perler bead by drawing both cord ends through. Push each Pony Bead and Perler Bead into place, snug up against the previous bead. 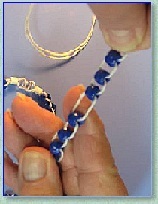 5) Continue adding the beads for the first part of the Rosary as shown. Hold the Crucifix sung in your work hand and slide all of the beads down the cord into place. 6) Our Pony Bead Rosaries are made without a Center Piece, so begin adding the Hail Mary decade beads right after the last Perler Bead. 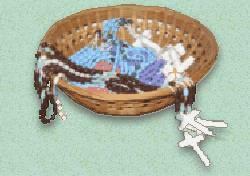 Rather than sliding each Pony Bead into place as it is added, work from the ends of the cord, adding all 10 Hail Mary beads at once. 7) When all 10 decade beads have been added, slide the beads down the cords, moving a few a little at a time, until all are snug in place. 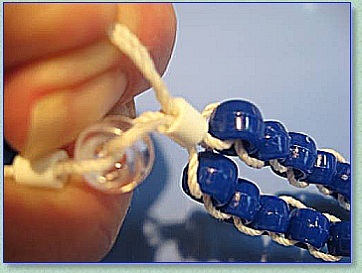 Adjust the Pony Beads so that all are facing the same direction. 9) Lay the Rosary out flat, lining up the beads to make sure the decade beads and Our Father beads are positioned correctly; make adjustments as needed. 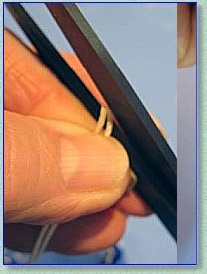 10) Trim the ends of the cord with sharp scissors. Apply a coat of clear nail enamel as needed to form a stiff end, and let dry completely. 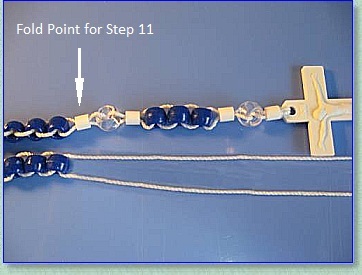 11) Fold the Rosary at the point indicated by the arrow in Step 9 to firmly grasp the Perler Bead between two fingers. 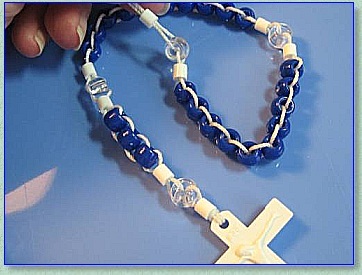 12) Slip both ends of the cord back through the Perler Bead, joining the 2 sides of the Rosary. 13) Pull both cords all the way through, lining up the two sides of the decade beads. 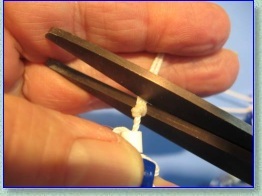 14) Tie a simple overhand knot using both cord ends, grasping the formed loop between your thumb and index finger. Gently pull the cords through and move the loop as close in as possible to the Perler Bead. The Knot formed must be large enough to keep from passing back through the Perler Bead. Pull firmly on both cords to tighten the Knot. Make it even tighter by pulling first on one cord and then the other while holding the Knot. This is the final knot of your Rosary, so it must be secure. 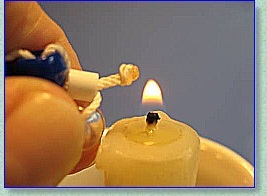 16) Melt only the nub with a flame. Or, coat entire knot and nub with clear nail enamel or glue to seal. Now hold up your finished Rosary and admire your beautiful work!